Howell was hired for the construction of the Village at Vehicle Vault in Parker, Colorado. 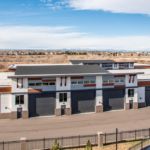 This multi-phased project included site work, outdoor plaza areas, and the construction of luxury car storage units ranging in size from 24’x24’ to 40’x80’. The buildings were constructed with slab on grade, structural steel and metal stud framing. The exteriors were a combination of block, stone, siding and stucco with clear stay windows.